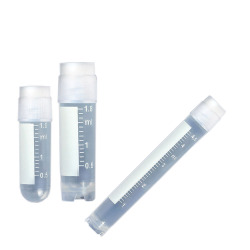 2mL CryoClear™ Vial with External Threads, Round Bottom Self-Standing- 500 per case | U.S. Plastic Corp.
2 mL CryoClear™ Cryogenic Vial with external threads, round bottom, and is self-standing. Dimensions: 12.5mm OD x 47.0mm Height. Sold in full cases of 500 per case.